Dangerous secrets were hidden in the sand ninety years ago. It’s a blink in time for the vampires of Los Angeles. But discovery is not always a good thing. The set of Cecil DeMille’s The Ten Commandments has been found in Guadalupe, CA, and a group of movie archeologists have started to excavate the site as an important find in film preservation history. There is an exclusive party being held to help fundraise and increase awareness of this unique site. Rumor has it that the archeologists have found something interesting, and they intend to reveal it at this event. That may explain why so many Kindred of diverse interests have secured an invitation to be present. City in the Sand contains a collection of scenes, handouts and a number of hyperlinks to various portions of the text as well as bookmarks, so you can always jump right to what you need with just a click. It also has over fifty pre-generated characters, reference sheets and a new player booklet to get your players ready as quickly as possible for this one-night live-action roleplaying experience. Read the interview with the writers on FlamesRising.com! Note: There are four files in this product. Customers are allowed to print and circulate as many copies of the New Player Booklet file as they need -- this is a special exception to our usual policies for this product. If you have questions about our PDF policies, check our Alternative Publishing FAQ. 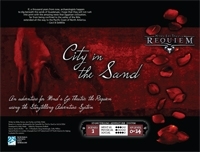 Listen to an audio review of City in the Sand from the Basics of the Game podcast!